Salamander Bay offers it’s own charming and unique attractions for visitors, like many of the neighbouring towns in Port Stephens and along the New South Wales coastline. Time here is best spent outdoors, either exploring the beautiful bay or surrounding parkland or simply pulling out the picnic set and lazing in the sun. Produce from the near by Hunter Valley is a must! 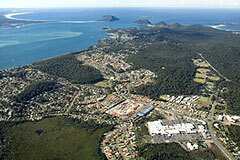 Salamander Shores, with sensational views of Port Stephens, provides a truly affordable waterfront accommodation destination. Time seems to have stood still in Salamander Bay. Rolling white sand kisses the pristine and glistening ocean, the food and wine here is fit for gods; this is a taste of paradise.